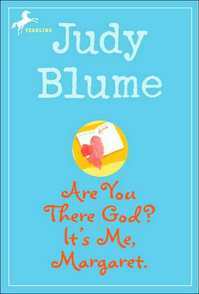 While putting books in the courier bin to send to other library branches the other day, I noticed a copy of Are You There God? It’s Me, Margaret in one of the bins. I have wanted to read this book for ages, and after checking the copy and realizing it was just going to another branch to be shelved, I checked it out myself. I have previously read Judy Blume’s Forever, and to be honest, I hated it. I just could not connect with the characters and the way their relationship played out, so I was a little hesitant to read this, knowing it was by the same author. Ultimately, there were parts that were a bit disappointing to me, but there was also some pretty interesting material. The story is about an 11/12 year old girl who is, basically, starting to grow up. She is concerned with growing her breasts and getting her period, she deals with liking boys and having her first kiss (sort of), and in the midst of all this, she begins the terribly complex task of trying to determine what religion, if any, she wants to be. Margaret herself was a character I couldn’t connect with. Just like in Forever, I found that Blume’s grasp on what it is like to be a girl growing up is completely different from what life was like for me. Obviously, Blume herself grew up, so it’s quite possible my life just played out in a different way, but whatever the reason, I found myself constantly scoffing at the book and thinking 12 year-olds don’t do that, or like she wouldn’t already know about that!, etc. etc. I found the religious aspect of this book interesting, however. I liked that Margaret was strong enough to understand her own personal connection with God, and was okay with being honest with herself that she didn’t feel any connection to the religious places she visited. There is some confusion within her, which is perfectly understandable, but for the most part Margaret figures out her own beliefs in her own way, and I liked that about her.